This article is about Giga Bowser's appearance in Super Smash Bros. Ultimate. For general information, see Giga Bowser. It has been suggested that this article or section be merged with Giga Bowser. Giga Bowser's render in Super Smash Bros. Ultimate. Giga Bowser returns in Super Smash Bros. Ultimate, playing a role as a boss in Classic Mode, in Adventure Mode: World of Light and as a Final Smash for Bowser. Giga Bowser appears as a boss in Classic Mode for Mario and Captain Falcon. In the final stage, Bowser initially appears instead of a boss; once he is KO'd, he transforms into Giga Bowser, similarly to the final stage of Melee's Adventure Mode at high difficulties. A Maxim Tomato appears for recovery as the battle begins. 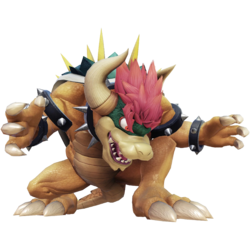 Giga Bowser retains his moveset from Brawl and SSB4, and as in those games, he is immune to all knockback and does not flinch from attacks; however, the player must deplete his HP to defeat him, as opposed to being launched off the screen, just like every other boss. Giga Bowser's attack speed and overall mobility is also drastically slower than in previous games, but he is large enough to take up most of the battlefield, making his attacks harder to avoid. Like in the previous games, Giga Bowser as a boss is playable as a character (albeit not through legitimate means), and notably has unused flinching and knockback animations, despite being immune to both of those effects in his battle. He also appears as a boss in Adventure Mode: World of Light in the Molten Fortress, where he has to be defeated in Final Destination with the Giga Bowser (Melee) music. After being defeated, Bowser will awaken and the player will also get Giga Bowser's spirit. Like in Melee, Giga Bowser can be playable by hacking. While he retains some of his moveset he received several nerfs to his moveset. All of his attacks are generally much slower in terms as every of his moveset gains significant amount of start up lag, ending lag, and landing lag. In addition to that, Giga Bowser can no longer perform a run, dash attack, down tilt, neutral aerial, and down aerial. Walking speed and frame data for numerous attacks are much slower. Giga Bowser now receives knockback while having a much higher damage. Up taunt and down taunt animations have been altered. Aside from the roar he makes during his boss intro, Giga Bowser no longer has voice clips during gameplay. The only time that Giga Bowser's knockback animations can be seen is in the Adventure Mode: World of Light, where characters with counters can launch him when he uses his forward tilt, forward smash, or down special. The animations can also be seen in the same mode if a strongly powered up Hothead used by the player hits Giga Bowser while sparking. If Giga Bowser is launched off of the stage, he will use his double jump and up special to recover. He has all of the normal ledge options. Although Giga Bowser cannot be normally brought to the blast line, he can still self-destruct by using Bowser Bomb toward the edge. Giga Bowser can still come in contact with and obtain a Smash Ball. However, he does not have a programmed Final Smash of his own, as he is not intended to use one (hence his boss battle's lack of Smash Balls). Once used, it will appear as if Bowser is transforming into Giga Bowser, but will then immediately shrink as if reverting back to his regular form, with a green flash accompanying him. However, this Final Smash has no effect whatsoever apart from the green flashes remaining onto Giga Bowser until he is KOed, while he is otherwise unaffected. If Giga Bowser uses another Smash Ball afterwards, another layer of green flashes will appear on him and so on. Like in SSB4, Giga Bowser retains Bowser's moveset from Brawl, despite Bowser receiving changes in SSB4, and further changes in Ultimate. If Giga Bowser is in a trapping Final Smash, such as Kirby's Ultra Sword, there a few moments where the player can see Giga Bowser revert to a T-pose position, likely because of the lack of animations for Giga Bowser being hit by the attack. Once the Final Smash ends, Giga Bowser will keep spinning in the air, and will stay that way until Training Mode is closed and reopened. ↑ "What if GIGA BOWSER was PLAYABLE! ?- Super Smash Bros. Ultimate Mods!”" - Source Gaming. ↑ Exclusively by hacking. Can only be done in normal matches as opposed to having HP. This page was last edited on April 10, 2019, at 19:36.